On 4th December 1957, W.J. 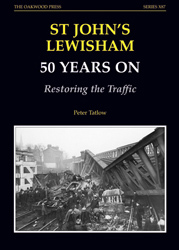 Trew, as he had done on many previous occasions previously, was driving the 4.56 pm steam-hauled express passenger train through south-east London from Cannon Street to Ramsgate conveying city workers and Christmas shoppers back to their homes – on this occasion, as so often at the time of year, in a thick London fog. His failure to locate and hence respond to two warning colour light signals led him to approach the final red signal, requiring him to stop his train, at a speed estimated at 30 mph or more. This was much too close to prevent him crashing heavily into the crowded stationary suburban electric train ahead of him. By stroke of misfortune the impact took place under a heavy steel flyover carrying other tracks and the derailed tender of his locomotive knocked out one of the overbridge’s supports causing it to fall on the leading coaches of his own train. By better fortune, another crowded commuter train about to cross the collapsed flyover was alerted in time to stop. Nonetheless, the casualty toll at 90 souls was the third worst in the country, to which suffering must be added the many injured, some very seriously. The emergency and voluntary services were soon on scene and their exploits were remarkable in recovering the injured and treating them in nearby hospitals. The police coped with the bodies, identifying them and informing the bereaved, while the traumatised were comforted and consoled by the caring services and pastoral bodies over the coming days. During the rescue stage the stability of the partially-collapsed flyover was of concern. Apart from some shoring, only once the injured were removed, could the work of temporarily supporting the delicately-balanced structure begin. The four tracks of the main line were opened eight days later, but this still left the line carried by the flyover to be dealt with. Even before the main line was reopened a start had been made to construct the trestle bases for a temporary replacement flyover, which was completed and the double line opened for traffic in seven weeks. A Ministry for Transport’s Inquiry was started, soon after which the inquest returned the verdict of accidental death. In the meantime, proceedings were instituted against the driver on the charge of manslaughter. The first jury were unable to agree and at the retrial the prosecution declined to offer any evidence and Trew, by then a broken man, was discharged. Over a period of more than six months an investigation of the train’s speed, braking equipment, signalling and sighting distance pertaining at the time of the accident was carried out. Despite the conclusion that it was not possible for the driver to see the necessary signals when seated on the left-hand side of the locomotive, the inspector deemed that he should have either crossed over the cab or interrupted his fireman from his duties to ask him to look out for these signals. As a result the driver was held solely responsible for the accident. A5 format, 160 pages, more than 100 illustrations.